It is so hard for me to believe that it is already Easter. I have always associated Easter with the start of spring. The start of new life (and renewed life). The weather here is finally turning and I am hoping that the warmer weather is here to stay. Holidays seem to be a time of tradition for me. When I was a kid, I can remember my grandparents taking us to an Easter egg hunt. Of course, coloring Easter eggs is a fun activity that is typically reserved to Easter. I can remember getting a new spring dress and shoes for Easter, and even on a few occasions a new hat too. Easter menus include ham and scalloped potatoes (although, I don't eat those, so I'm not sure why I would associate that) and of course, colored eggs. Easter morning always included the hunt for the Easter basket and the yummy chocolates and chocolate eggs. We colored our Easter eggs just yesterday. The son has gotten 'too big' to color eggs, but my daughter still enjoys it. Of course, she wants to color a lot of eggs, but I am the only one that eats the hard boiled eggs, so we have to balance the desire to color with how many eggs I can eat! We enjoy using a white crayon to write a message that magically appears when the egg is colored. The menu for Easter has evolved over the years. This year it is just the four of us at home. Of course, I can't go without ham, but since, as with eggs, I'm the only one in the house that generally eats it, I go with a small one. Fortunately for me, there is a quarter ham version of the Hormel Cure 81 Brown Sugar Boneless Ham. I place it in a covered dish with a bit of soda (instead of water) and warm it in a low oven while I prepare dinner for the family. Know your Numbers: When purchasing ham for a large crowd, such as Easter dinner, count the number of guests scheduled to attend. It's a good idea to get about a pound of ham for every 3-4 people. Don't forget to estimate a little extra for unexpected guests, and everyone's favorite - leftovers!" As Simple as Heat & Serve: Hams are typically sold as a fully cooked product, so when preparing, all you need to do is heat it until the ham is hot throughout. A good gauge is when the ham reaches about 140-145 degrees. It's a simple protein solution when you are pressed for time. A Ham for Every Occasion: In recent years, various cuts and flavors of ham have been introduced, making it a great option for entertaining or a weeknight family dinner. Hormel Cure 81 ham items are available pre-diced or pre-cubed for an easy addition to your morning omelet, or in ham steaks that are great to throw on the grill. How do you celebrate Easter? Are there recipes that you make every spring? Have leftovers from your Easter celebration? There are some great recipes that you can try on the Hormel Cure 81 page. Happy Easter! Hope you all have a nice day with family and friends. When I was a kid, Spring Break was just a week off of school. There was one year that we headed on a family vacation to Arizona, but aside from that they were just a week at home. I'm not really sure that I remember that my friends went anywhere either. There wasn't a 'fancy' term for staying home that week, it was just what we did. Nowadays, of course, the practice of staying close to home and enjoying all that your broader community offers has a label - staycation. Now that I am a mom, we tend to spend the week of spring break close to home. Making some short driving trips, but otherwise spending time with friends. We like to fill the week with activities like bike riding (although it seems to be very windy when we do), bowling, jumping (used to be at an inflatables place, but now we have trampoline places), heading to the playground, swimming at the Y (or a water park) and hanging out with friends. This year our spring break has included play dates with friends, movies, breakfast out, swimming at the Y, board games and sleepovers. Still to come is a chocolate factory tour, movie and lunch at a dine in theater, time with Grandma and Grandpa, a trip to the science center, a visit to the bookstore, bowling and probably more dining out. Many businesses know that there are many families doing staycations and offer specials during the week. The week before spring break, our local Y sent out a special pool schedule for spring break. I have seen special offers from many other local businesses that know that parents will be looking for something to make the break fun. If you are in the Columbus area, or close enough to drive, like we are, then you might want to check out the special offer at Star Lanes Polaris. Their special is designed to span several weeks of spring break, so you can take advantage now through April 10th. For $15, children ages 12 and under, will receive a kid's meal menu item, game of bowling and shoes and $5 arcard game card. Available weekdays from 11am to 3pm. Must be accompanied by an adult. 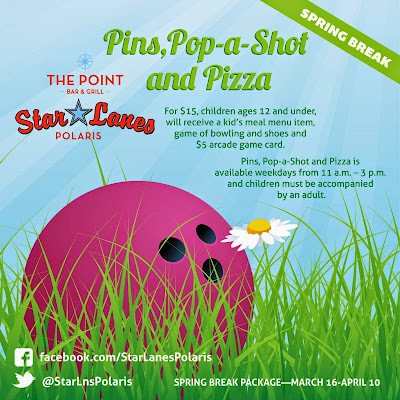 Why not gather together your group of moms (or dads) and plan a playdate at Star Lanes. You can all visit, while the kids play or join in the fun and challenge the kids to a game. No compensation was received for this post. A promotional gift card was provided for a future visit. All opinions are my own or that of my family.